The novel is not really about Domingos though; instead, it is a multi-generational tale of life as a peasant in twentieth-century Portugal. It’s a time of great historical change, as the country overthrows the monarchy to form a republic, one which later evolves into a dictatorship. However, for the poor people nothing changes, even when the dictatorship comes to its peaceful end – the fields, and the hardship the workers face, remain the same. The sad thing is that nothing appears to be able to help the workers move above this semi-servitude, and that there is nobody who can stand by them in their attempt to do so. If it all sounds a little grim, you’d be mistaken. It’s a serious topic, but handled ironically; Saramago has a unique style and can always find an intriguing angle from which to get his message across. Starvation, death and torture are mostly described with a light touch (in one memorable torture scene, we view events through the eyes of an ant – lending matters a very different perspective). In other hands, this could be an unreadable litany of sufferings; it is the sign of a great writer that Raised from the Ground rises above this. It’s a style which does take a bit of getting used to, and I was initially suspicious of the verbal gymnastics. However, the more I read, the more it appealed, and the more I appreciated the way Saramago set out his story. In short, Raised from the Ground is superb. Saramago’s style takes time to get used to for a reader encountering it for the first time, but it’s definitely worth the effort involved. After nearly four-hundred pages of struggle, the upbeat ending is throughly enjoyable – just as long as you ignore Miguel’s review telling you what really happens… Jull Costa’s translation is also excellent; it must have been tricky to perfect the voice needed, but I think she nails it. I'm glad you enjoyed this! I haven't read it, but I absolutely loved “Blindness”. At the time, I found it to be the most disturbing novel I'd ever read. Another book of his I've read is “The Cave”, but it left me a bit cold. I've enjoyed the Saramago's I've read (The Double and The Elephant's Journey) and will be looking to read another soon. I like the sound of this one, although I don't remember coming across mention of it before. This sounds great. I read 'The Double' last year and loved it and I really want to read more Saramago. Thanks for mentioning the podcast with Margaret Jull Costa. I could happily listen to her for hours – in fact I dashed out and bought 'All The Names' on the back of listening to it! I also have 'Blindness' on the shelf. Tony, I'm glad you enjoyed this novel, and that I had a small role in leading you to it. Good luck with Blindness, it's a beautiful, dark novel too. And if you like it, I hope you next give Seeing a try. Is no one going to address the elephant in the room? 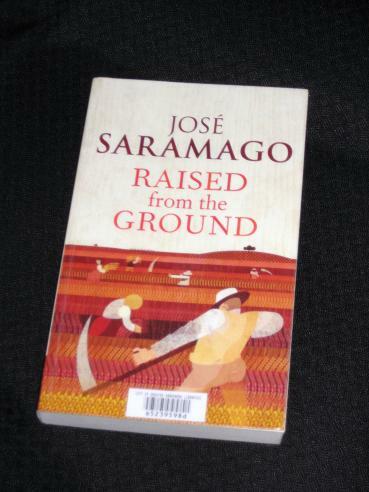 The author's name is Saramago, not Samarago. LOVE your blog, but this is driving me nuts that you cannot get the author's name right…it's a respect thing for me. This has been on my short list for way too long. Thanks for the reminder! interpolations – No worries 🙂 It's a great read, and (for me) a great introduction to Saramago's work.